Here at Human Made we are above all a development-led company. We do a lot of custom development work for clients and coding is our life blood. That is why products such as WP Remote, BackupWordPress and our many smaller projects are so important to us. They give us a real chance to innovate, experiment and keep improving skills and knowledge. Not only do many of these projects produce useful plugins or solutions in their own right but they are often solutions that are transferrable to client work so there are benefits all round. However, just producing a useful product is not enough. 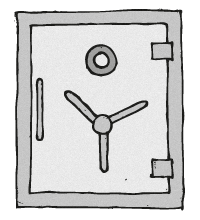 If it’s going to remain useful, a product needs continual and ongoing development work and unfortunately when client work gets busy this is the first thing that is squeezed out. The Holy Grail for a product is to be self-sustaining, bringing in enough income to fund the development work it needs to continue to grow and expand. Lots of web apps now are created as a commercial proposition from the outset, but there are also many others in the marketplace that have taken a more gradual journey, being developed, refined and struggling against other commitments along the way. As WP Remote makes a key step with its first chargeable premium features, it is interesting to look back on its story and the evolution from free plugin, through some highs and lows, to a bright future as a self-sustaining web app. A blast from the past, WP Remote as it used to look. WP Remote began life back in 2009 as a humble plugin called Site Monitor. 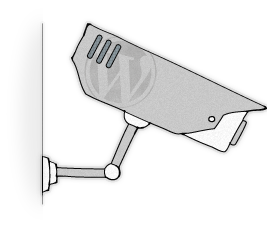 Tom wanted a way to monitor the version of WordPress on his client sites. There was nothing around to do the job so he wrote a plugin that let him see WP version from WP Admin using XML-RPC, the built in WordPress API. This was an easy and effective solution but had certain drawbacks. Using XML-RPC as a solution was inherently insecure as the user name and password are required. Also, despite Tom’s best efforts to get more features added to the API, only the version of WP core could be viewed, not themes or plugins. In early 2010, the decision was made to offer the solution to a wider audience and turn Site Monitor into a hosted app. WP Remote was born, with a GUI written by Joe in Cappuccino. The product launch was announced in WP Hackers and client sign-up began. There was also an important move from using XML-RPC to using a bespoke public API, which could more easily be modified and was available to everyone. As Joe and Tom became Human Made Ltd and got very busy with client work, very little changed with WP Remote for quite a while, although sign-ups did kept gradually increasing. Do you remember this dashboard? By late 2011 poor WP Remote was feeling a little neglected and unloved. But it did retain a good user base, particularly within the industry and Tom and Joe still believed that it was a relevant and useful product with a lot of potential. It was time for a little make-over and some development TLC. There was a lot of brainstorming, Matt did a redesign and Joe rewrote the GUI in Knockout.js. The result was the new-style WP Remote as it looks and feels today, ready to fight again. triggered a huge surge in sign-ups and lots of news coverage. It was very exciting, but once again we failed to take advantage as client work came to the fore and WP Remote development stalled. Sign-ups still continued to grow however, with 40,000 sites being monitored by 15,000 users by early 2013. Finally in 2013 we decided to give WP Remote the place it rightfully deserves. Noel has joined Human Made Ltd with a focus on product development and we have some experienced new developers on board. However, this alone will not be enough for WP Remote to hold its own against client work if it cannot support itself. In order for WP Remote to remain a long-term priority project for Human Made we’ve begun to introduce chargeable premium features. The monitoring and updating features will always be free but there is lots of scope for many exciting premium features. 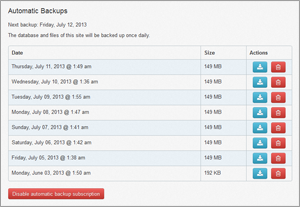 These have already begun with Automatic Backups and there are more to follow. Looking further into the future we’ve a vision for WP Remote as a Cloud-based product that sits underneath other services, so watch this space. Automatic Backups gives a real demonstration of how we achieve multiple benefits from our development projects; the backup capability for WP Remote is built on the solid foundations of our extremely popular plugin BackUpWordPress. Our main challenge with backups has been balancing storage against cost. They have come and gone in previous iterations but are now making an eagerly awaited reappearance, here to stay as a premium feature. WP Remote has had a long journey from a bespoke personal solution to a full commercial product. Right from the start we’ve seen WP Remote as a really useful service and one that the industry would use; we’ve now got a way of maintaining it through chargeable premium features. Peer usage and review has always been important to us and as WP Remote continues to develop we intend to remain true to its origins as something that was designed not as a money making proposition, but as a great solution to solve a problem.